Today, we are going to implement our Bird into the game. Let me tell you a little bit about our main character. Flaps here was a happy red bird flying about his business until someone smashed him into a sewer pipe. Now he has returned, and he's watching you very intently. (Sorry Kyle, I still think this is the ugliest bird I've ever seen). Now that you've met our main character, let's make him fly. 2. If I ask you to run your code, you will open your ZombieBird-desktop project and run DesktopLauncher.java. I forgot to mention (you probably have figured it out already), that we will use a Y Down coordinate system. This means that the upper left corner of the screen has the coordinates (0, 0). What does this mean? It means that if our Bird has a positive Y velocity, we will be moving downwards. Our game will run on everything from iPhone to iPad to all the different Android devices out there. We need to handle screen resolution properly. To do this, we are going to assume that the width of the game is always 136. The height will be dynamically determined! We will calculate our device's screen resolution and determine how tall the game should be. We need to give Flaps his own Class. Let's do that. 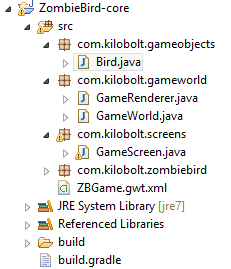 - Create a new package called com.kilobolt.gameobjects and create a Bird class. Our Bird needs a position, a velocity and acceleration (more on this below). We also need a rotation angle (for when the bird rotates) and a width and height. Vector2 is a powerful built-in libGDX class. If you are not familiar with mathematical vectors, that's okay! We are just going to treat it as an object that can hold two values: an x component and a y component. position.x then refers to the x coordinate, and velocity.y would correspond to the speed in the y direction. acceleration just means change in velocity, just like velocity means change in position. This will become much clearer in just a second. What information do we need to create a new Bird? We need to know what its X position should be, what its Y position should be, how wide it should be and how tall it should be. 2. onClick method (which will be called when the screen is clicked or touched). We also need to create a bunch of getters to allow access to some of our Bird object's instance variables. 1. We add our scaled acceleration vector (we will come back to this) to our velocity vector. This gives us our new velocity. For those of you not familiar, this is how the earth's gravity works. Your downward speed increases by 9.8 m/s every second. 2. Remember that Flappy Bird physics has a max velocity cap (there's some sort of terminal velocity). I have experimented with this and set a velocity.y cap at 200. 3. We add the updated scaled velocity to the bird's position (this gives us our new position). What do I mean by scaled in #1 and #3 above? I mean that we multiply the acceleration and velocity vectors by the delta, which is the amount of time that has passed since the update method was previously called. This has a normalizing effect. If your game slows down for any reason, your delta will go up (your processor will have taken longer time to complete the previous iteration, or repetition, of the loop). By scaling our Vectors with delta, we can achieve frame-rate independent movement. If the update method took twice as long to execute, then we just move our character by 2x the original velocity, and so on. We will be applying this scaling to our rotation later on! Now that our bird is ready, we will unleash it into the GameWorld! Every time you create a new Object, you allocate a little bit of memory in RAM for that object (specifically in the Heap). Once your Heap fills up, a subroutine called a Garbage Collector will come in and clean up your memory to ensure that you do not run out of space. This is great, except when you are building a game. Every time the garbage collector comes into play, your game will stutter for several essential milliseconds. To avoid garbage collection, you need to avoid allocating new objects whenever possible. ﻿If you'd like, you can remove the rectangle drawing code from the GameRenderer to remove errors. We will do this in Day 6. Now we must initialize the bird. What information do we need? The x, y, width and height (these are the four values we need to call the Bird's constructor that we've created above). The x should be 33 (that's where the bird stays the entire time). The width should be 17. The height will be 12. What about the y? Based on my calculations, it should be 5 pixels above the vertical middle of the screen. (Remember that we are scaling everything down to a 137 x ??? screen resolution, where the height is determined by getting the ratio between device screen height and screen width, and multiplying by 137). So how do we get midPointY? We will ask our GameScreen to give it to us. Remember that the GameWorld constructor is invoked when the GameScreen creates a GameWorld object. So then we can create an additional parameter to ask GameScreen to give us the midPointY. Now we need to go make some changes to our GameScreen. We have an error, as expected, in the line where we call the GameWorld constructor. We have just said that "to create a new GameWorld, you must give us an integer", so we must do that! Let's ask GameScreen to calculate the midPointY of the screen and pass it into the constructor. When I say midPointY, this is what I mean. Remember that our game will be 136 units wide. Our screen may be 1080 pixels wide, so we must scale everything down by about 1/8. To get the game height, we must take the screen height and scale that down by the same factor! We can retrieve the screen width and height using the following methods: Gdx.graphics.getWidth() and Gdx.graphics.getHeight(). Now that we have created our Bird, we need to be able to control it. So let's add an input handler! The diagram is back! We will briefly turn our attention to the Framework Helpers on the 3rd level. The ZBGame needs help in order to handle input, images, sounds and etc. We will be creating two classes right now. The first class will be the InputHandler which, as the name suggests, will react to various inputs. In our case, the only input we need to worry about is the touch (clicks are registered as touches on PC/Mac). The second class will be the AssetLoader which will load various images, animations and sounds for us. We will get back to the AssetLoader very soon. Let's first implement our InputHandler. Create the package called com.kilobolt.zbHelpers, and create an InputHandler class. The InputHandler is extremely easy to implement. We just have to implement the InputProcessor, which is an interface between platform-dependent code and our code. When our platform (Android, iOS, etc) receives some kind of input, such as a touch, it will call a method inside the current InputProcessor, which we will provide by implementing it. That gives us a bunch of methods that we can work with. For now, we only have to worry about the touchDown() method, however. The TouchDown method should call our Bird's onClick method, but we have no reference to our Bird object. We can't call any of Bird's methods until get a reference to our Bird. Then we ask ourselves, who has a reference to our current bird? GameWorld does, which belongs to GameScreen! So we will ask GameScreen to send the Bird to us. return true; // Return true to say we handled the touch. Now we just have to go back to the GameScreen and create a new InputHandler, and attach it to our game! Update your constructor to be as follows: In the very last line, we are telling libGDX to take our new InputHandler as its processor. Gdx.input.setInputProcessor() takes in an InputProcessor object. Since we implemented InputProcessor in our very own InpurHandler, we can give our InputHandler to this instead. Rather than type all this, the one-line solution in the code above should work fine. We have created our Bird class, created a Bird object inside our GameWorld, and created an InputHandler which will call our Bird's onClick method, which will make it fly upwards! Join me in Day 6, where we will Render our bird and its grim necropolis habitat!